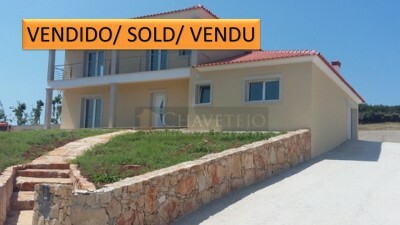 A brand new 4 bedroom detached property currently in the final phases of construction for sale near Ansião. The property sits in a lovely location with 360 degree views of the countryside. Its garden is lovely and flat so perfect for anymore looking to add a swimming pool. The planning has already been approved for an 8×4 pool and pool house but this isn’t included in the price. The house already has double glazing fitted with exterior shutters. The pre installation for central heating has already been fitted, so all you need to do is choose what type of heating you would like and fit the boiler as the radiators have already been installed. 2 solar panels will be fitted with a water deposit. The property has in total 4 bedrooms, 3 bathrooms, a spacious open space kitchen diner and a separate lounge area. The kitchen will have most of the appliances included and the space will be fitted out with spacious cupboards, base and wall. All of the floors will be tiled except from the bedrooms which will have laminate flooring. All of the bedrooms have built in wardrobes offering plenty of storage. The rooms are all good sizes and have lots of natural light. There also balcony’s to the back. There will also be electric gates and garage door fitted. The property is located in a village a short drive away from the municipality town of Ansião where you find, registry office, notary services, banks, supermarkets, schools, public swimming pool parks, cafes, restaurants, etc. Around this area there are typical villages, mills, panoramic views, roman ruins, monuments, river beaches etc. The small castle city of Penela is about 23 km distance. The historic town of Tomar, which is home to the UNESCO listed Convento do Cristo, founded by the Templars is only 50 minutes drive from the property. Figueira da Foz the beautiful coastal beach is easily accessed in approximately 50 to 55 minutes by car via the IC8. All major European high street shopping is available in city of Coimbra the 3rd biggest city in Portugal which is only 45 minutes drive on the A13 motorway. Porto and Lisbon airports are at similar distance from the property, Porto is approximately 1 hour and 50 minutes drive and Lisbon approximately 1 hour and 45 minutes by car.